I have brewed this seasonal beer from Firestone Walker before but as an extract recipe. Its a little late for brewing seasonal beers to be ready for the Christmas season, but I really wanted to brew this beer. I am trying to get a little more technical with my brewing too so I am adding a recipe specification section to the write up. This is a clone of Velvet Merkin so Ill call it something close to that.... how about Fleece Bush. I didn't do a starter since it was one of those decide to brew that day so I had an extra recently expired English Ale Yeast vile in my refrigerator and I bought 2 fresh new ones to pitch. Splitting the new vials between the carboys and then splitting the old yeast into each one. Not ideal but it should get my fermentation started OK. I filled the mashtun with 8 gallons of water and began heating it to 165 °F. After the water reached 165 °F I added the grain and began stirring. After stirring the mash vigorously for a few minutes the temperature had dropped down to a perfect 158 °F. I placed a newly made mashtun insulation jacket around the vessel and let it sit for 1 hour. I cooled the wort and pitched the yeast into two 6.5 gallon carboys. I am extremely pleased with how this recipe turned out. I don't know how it will turn out but It was a successful all grain brewing session. I hit all my temperatures and nothing went wrong and hit my OG right on. I was also pleased that it only took 5 hours for this session down from 6.5 for my last brewing experience. The beer tasted great possibly one of the best I've ever tasted at transfer I am really excited to get this kegged and start drinking it. I kegged and bottled the brew today I used 5 gallons to keg and bottled the other 5 gallons. I had not bottled in a long time so it didn't go perfectly smooth but I got it done. The biggest issue is that I forgot that I lent my corn sugar out because I don't use it very much. Just as I started to transfer the beer into the bottling bucket I made this realization. I quickly drove down to the brew store and picked up a pound. I yielded 28 x 22 oz. bottles. I took a gravity reading and saw it had dropped a couple points in secondary bringing the final alcohol to 5.25%. In a follow up to my Celiacs Wheat Dream my gluten intolerant co worker wanted to try a new enzyme I had read about. This enzyme according to Charlie Papazian had gluten reduction properties and can make your beer drinkable for the gluten impaired people in your life. Since the doesn't completely eliminate the gluten from beer it just minimizes it we are going with Glutenus Minimus. Which someone has already used for a beer but I came up with it not knowing that. On Friday May 20th during lunch, Pat and I drove to Brew Brothers and purchased ingredients for the beer. The brew process was pretty standard other than I added a teaspoon of gypsum to the water to lower the pH and after the boil had completed and the yeast was pitched I added a vial of Clarex. If you would like to read more about Clarex (or Clarity-Ferm) check out this link from the manufacturer. Clarex is not recognized by the FDA as a reducer of gluten so it is only approved for use as a clarifier to reduce chill haze. But, according to empirical evidence found on multiple sites and anecdotal evidence from employees of both brew supply stores it looks like it works. There was a small SNAFU during the brew process the thermometer broke in the kettle. So... I am going to claim ignorance and hope that the metal beads in the bottom of the thermometer were steel and not lead. 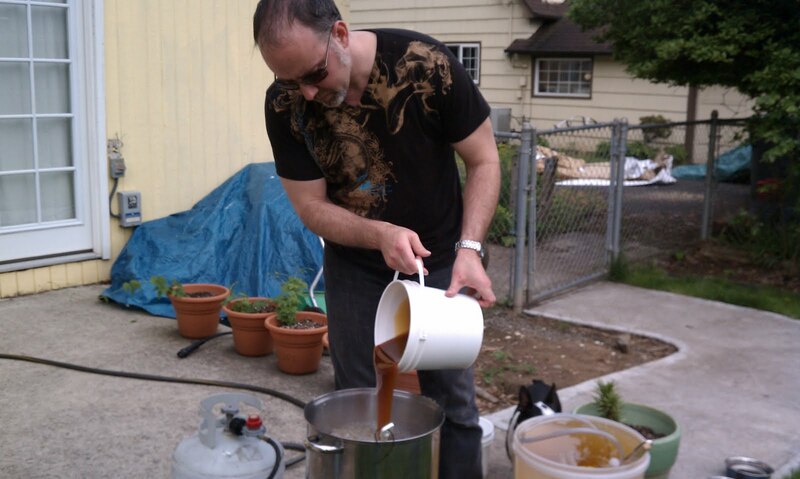 After I discovered the broken thermometer I quickly stopped the boil and transfered the wort into a bucket standing by. At the bottom there was about 30 metal beads, after removing the beads I rinsed the kettle out and poured the wort back in and continued the 60 min boil. So fingers crossed I won't be getting lead poisoning. UPDATE 5/25/11 : Pat wanted me to post a picture of the beer fermenting in the primary so here it is. As you can see the layer of trub on the bottom which is yeast and grain that was suspended in the wort during the boil. In a few days I will transfer to the secondary where the yeast will start to ferment the last remaining sugars before it is ready to be bottled. Since Pat is a brewing n00b he doesn't have a kegging system yet, we will be bottling. 1.014 at transfer still a lot of suspended solids in the beer when I transferred. I don't know if this is becasue of the clari-ferm enzyme of some other reason. The recipe was pretty simple but after a couple of days a great deal of sediment has accumulated at the bottom of the secondary fermenter. Perhaps I transferred to secondary too soon. Interestingly this has the exact same gravity at transfer as the Ceiliacs Wheat Dream I brewed last. Today I finally got around to bottling the beer for Pat. I was holding off becasue I wanted him to see the process (Read: I didn't want to do it by myself). The picture to the left is transering from the secondary to a bucket. After this third transfer I took the final gravity measurement and added a cup of corn sugar. The sugar was first dissolved in boiling water then cooled. Using a siphon and a bottle filler the bottles were filled and then capped. The beer was extremely clear and tasted like a good mellow pale ale. I believe the clarity was caused by the combination of the Irish Moss and the Clarity-Ferm. I hope Pat enjoys his delicious beer. The big pay off on this is if he gets into home brewing if the gluten reduction was successful. You can never have enough brew buddies. This tactful name was brought about by this. While I in no way condone domestic violence I am a sucker for word play. I have been wanting to try a beer with citra hops for a while now but havent had a chance. Citra is a proprietary hops developed by Sierra Nevada named for its very strong citrus aroma and flavor. It is a cross between Hallertau, Mittelfreuh, U.S. Tettnanger, Bavarian, Brewers Gold and E.K. Golding. A very complex but wonderful hop. This is used in such popular beers as Sierra Nevada's "Torpedo Extra IPA" and Widmer's "Sunburn" summer seasonal. Citra is very high (22%-24%) cohumulone which is sometimes described as the "Good" bitterness in beer. 4.0 oz. Citra (13.4% alpha-acid, whole leaf) Note: Higher than most strands (10-%12%) but should be fine. On Friday December 31st I worked half a day so I decided to take a couple co-workers (Ones Blag) and teach them how to brew. This was more complicated than I originally anticipated. Since Brew Brothers is very close to my work I decided to go there. However when I reached their location they had moved. Only a short distance but enough that I had call and find their new store. When I got there the guy that usually works wasn't available. This was not ideal since I was hoping he would help me put together my recipe. After that unfortunate turn of events I went to my normal store Main Street Homebrew Supply Co they also had moved recently. I voyaged to their new store. The new store was much nicer and 4 times as big, a huge improvement, much more space. 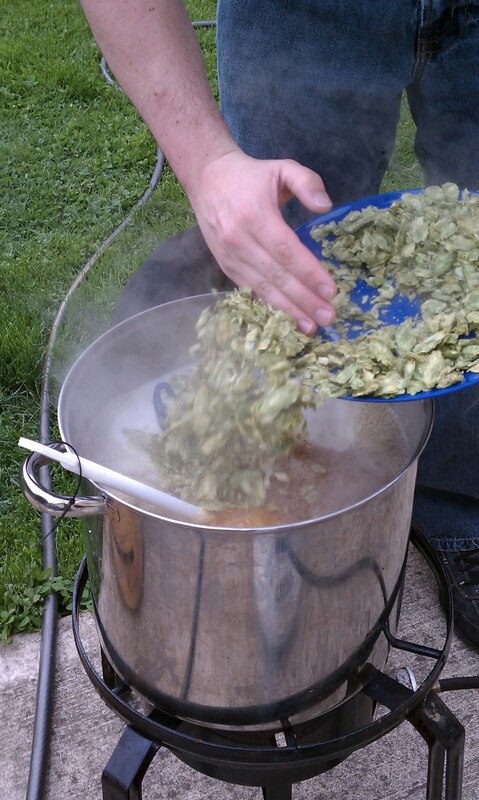 The smell of this batch is like nothing i have experienced before pure hoppy goodness. I have done a couple IPA's in the past but nothing that has been the truly carnal hop experience that my nasal passages knew with this IPA. Sorry I didn't take any pictures but I mean if you are really hurting for some pics look at any of my other posts and imagine that they were from this batch. 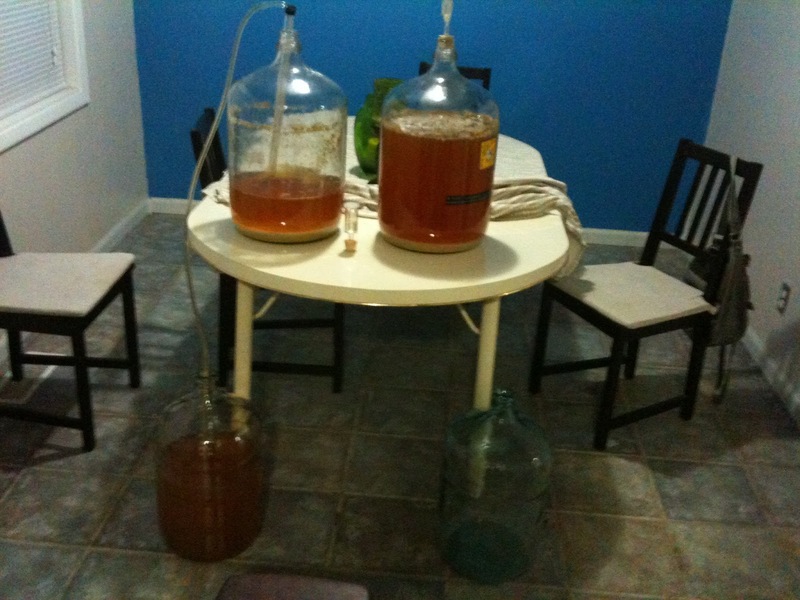 UPDATE: Tuesday 1/11/2011:I transferred the beer to the secondary fermenter today when I put my head into the primary and took a big whiff I was mortified by what I smelled. I don't know what has happened or if it is a property of the Citra hops but my nostrils were burning intensely. The pain that I felt was immediate and agonizing. It was similar to when a friend of mine had made apple cider and it had turned into vinegar. When I tasted it however the burning vinegar taste was not present. 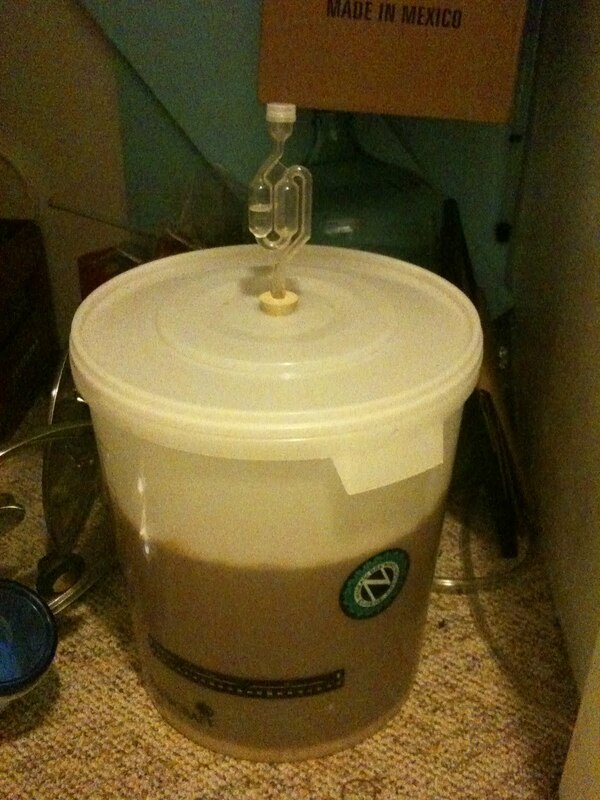 Relieved I transferred to the secondary and placed in the brew closet. Overall it tasted pretty good however it was missing a lot of alcohol taste and the hoppiness I was hoping for. This may be cause because I transferred too early but I hope it will get more hoppy and the ABV will jump up too. . Somehow my double IPA has become a half IPA. I am hoping that it is because the fermentation is not fully completed but this low of an alcohol content is troubling for an alleged double. I did start with a much lower starting gravity than I would have liked also so that may have contributed to it. The carboy has stopped bubbeling and I transfered it to the keg and took a reading. Dissapointingly, but not unexpectedly, this has turned into a standard black Eye-PA unfortunately something happened and the OG was not high enough. I don't know what caused this phenomenon. Perhaps it is because I didn't get every drop of the sticky malt extract out of the bucket. It was very cold that day and after adding the extract there was a lot at the bottom left. Only after I had finished the boil and placed it in the fermentation bucket did I realize this though. I did taste the beer and was very happy with the flavor though. The citrus notes did not come through as thick as I was anticipating. I believe this is because of the dark malts that were added to give the beer its dark color also gave it a roasted flavor, overpowering the Citra. I am very pleased with how the beer turned out and cant wait to drink it on Sunday when it has completed carbonating.